I have mixed feelings about the Harry Potter series. I first heard about it in 2000 when the retail store I worked at started carrying paraphernalia from the books. I had no idea what words like Quidditch, Muggle or Voldemort meant. But then the first book in the series was turned into a film in late 2001 and became a major blockbuster. That was enough to pique my interest, so I watched it when it came out on video. And I was thoroughly unimpressed. The acting was wooden, the sets overpowered the actors, the story was oddly paced, and the climax left me underwhelmed and bewildered. This couldn’t be the story that started one of the most popular book series of all time, could it? It got worse with the second film Harry Potter and the Chamber of Secrets. That felt like a retread of the first film, but with an even more confusing climax. I was ready to give up on Harry Potter entirely when the third film came out: Harry Potter and the Prisoner of Azkaban. And suddenly I decided to give Harry another chance. That film was so thoroughly different from the first two and totally enjoyable that I finally gave in and started reading the books. The first three books were all right, but in my opinion the fourth one (Harry Potter and the Goblet of Fire) is the best of the seven. It’s a pity the movie version didn’t do the book justice at all. I stopped watching the films after the fourth one because I figured if the filmmakers couldn’t get the fourth one right there was no way they could do the others well. They’re just too long and complex to fit in such a short running time. Plus, I didn’t enjoy the fifth book, and I couldn’t stand to torture myself by slogging through that dreadful story again. The sixth and seventh books were decent, though I figured out the final Horcrux long before I started reading Harry Potter and the Deathly Hallows, so the ending wasn’t surprising. In summary, I don’t much care for Harry Potter. So it was with some trepidation that I recently checked out Harry Potter and the Sorcerer’s Stone again. I hadn’t seen the movie in years, so I figured this would be a good test to see how it holds up after all these years. And, to my surprise, I found myself actually enjoying it this time around. Oh, it’s not perfect, and I still noticed plenty of flaws. But I had a lot more fun than I thought I would, and more often than not I was engrossed in the story and characters. That’s why I’m going to share the things I changed my mind about on my most recent viewing of Harry Potter and the Sorcerer’s Stone, and I’ll follow that up by adding a few things that still aren’t very good. So grab your magic wand and let’s see if Harry Potter spells good entertainment. Everything Before Hogwarts – The opening scene with baby Harry makes a lot more sense with some context. Also, I really enjoyed Harry’s first use of magic at the snake exhibit. It’s amusing and it sets up an important plot point for the next film to delve into. Harry’s relatives are extremely nasty and bigoted, but at least they’re swept out of the way pretty quickly. I love the way Hagrid is portrayed at the beginning. He’s a lovable giant who is always watching out for Harry. Unfortunately, once he gets to Hogwarts he becomes absent-minded and hopelessly silly. All of his depth is removed seemingly with the flick of wand. His oft-repeated line “I should not have said that” gets old fast. He’s not Screech, after all (If you get that reference, kudos to you). 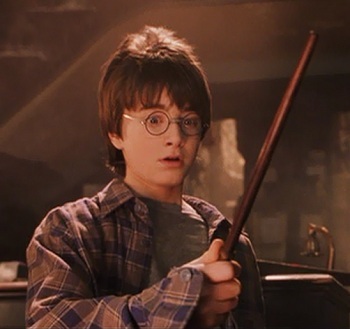 My favorite pre-Hogwarts part is when Harry gets his wand and receives a warning about its twin, which belonged to Voldemort. It gives a great taste of the adventures that came before and the ones that are on the horizon. Very well done. The Sorting Hat Scene – I now realize that this whole scene works brilliantly. The thing that changed for me was that I focused on the adults, not just the kids. When Harry enters the great hall and Severus Snape sees him for the first time, it’s quite an emotional moment now that I understand Snape’s history with Harry’s father and mother. 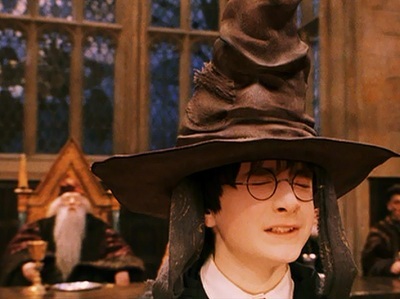 Also, when Harry gets the Sorting Hat placed on him is, in my opinion, the most pivotal point for the character. He has to fight the negative influence that Voldemort left on him and try to choose the better path his parents left him. Very dramatic. This scene has a lot more going on under the surface than it seems at first glance. No wonder Dumbledore takes such a keen interest in the proceedings. All the Setups – This movie is mostly about setting rules and introducing us to a new world. And it definitely succeeds in these areas. The characters briefly mention a lot of mythical creatures, and we get to actually see a centaur, dragon, troll, unicorn, and many ghosts and goblins. Most of these creatures and apparitions become important later on, so it’s nice to see them introduced so early in the series. Also, I like how Wizard’s Chess, Quidditch, and other things pay off in the climax of this particular story. It’s not too busy setting up other books to have a satisfying story of its own. The Kids – The actors playing Harry, Ron Weasley, and Hermione Granger are all passable. They’re precocious and stilted, but that’s to be expected at their age. Their characters make a lot of childish mistakes, but they’re not as foolish as I once thought they were. Before putting themselves in mortal danger in the climax, they tried to warn Dumbledore and other teachers to a possible danger, but they were ignored. Only after their first plan failed did they take it upon themselves to face the threat on their own. The Mystery – To me, the mystery gimmick in the Harry Potter books gets more far-fetched each time. For example, it takes the kids several months to find Nicholas Flamel because they weren’t looking in the right book. Why is the wizard world so backwards? The Internet is a much better way to store and find information than a dusty library full of decomposing tomes. I guess technology and magic don’t mix. Mostly, the problem is that the mystery has to be stretched over the course of a whole school year every time. It gets a little too coincidental after a while. This first time out, the mystery isn’t awful, but it’s just dull. We never meet Flamel, we barely know anything about Voldemort, and we only have a passing knowledge of the Sorcerer’s Stone itself. So the stakes are vague, and there’s not much reason to care whether or not the kids uncover the truth. Plus, if Harry hadn’t gotten to the mirror, the stone would have been perfectly safe, so ultimately his quest is reckless and pointless. That’s what happens when people assume too much. 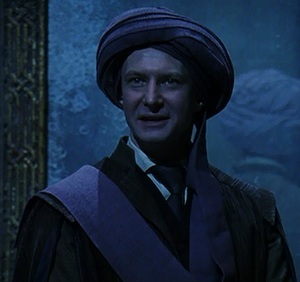 The “Surprise” Villain – When Professor Quirrell was revealed to be the villain, I distinctly remember having a total “And you are?” moment. This time, I was looking for him throughout the film to see if I just didn’t notice him much the first time. Nope. He really isn’t in this movie much at all. In the few scenes he does make an appearance, he’s either in the background or he only has one or two lines. So it’s not an effective twist to make him the villain. Hedwig – This isn’t a big thing, but I don’t understand the purpose of Harry Potter having an owl. Is it just to make him more wizard-y? I can’t remember if there was ever a point to Hedwig other than having him deliver packages from time to time. I don’t even remember hearing his name mentioned in this whole film, so he clearly wasn’t too important. He’s just brought up a few times and then forgotten for most of the film. 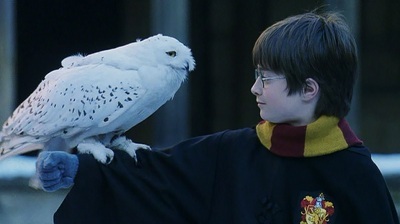 One scene I still don’t understand is when Harry brings Hedwig outside around Christmas and releases him into the air. I don’t know what this is supposed to symbolize or do to further the story. It just seems to be an excuse to show a bird’s-eye view of Hogwarts. If anyone knows what that scene is supposed to accomplish, I would love to hear. In the end, Harry Potter and the Sorcerer’s Stone isn’t a terrible film, nor is it a great one. It’s just okay. And that’s all it aspires to be. I’m not sure how this led to one of the most popular book/film series of all time, but I can’t deny it does have a certain charm that lingers. Maybe it’s the rambunctious characters, the memorable visuals, or John Williams’ music. Whatever it is, this film almost rocks. This entry was posted in Movies That Improve and tagged books, fantasy, films, harry potter, movie review, movies. Bookmark the permalink. I was at a National VICA competition back around 2002 or 2003. During some of our off time I went to the hotel room and ended up watching Chamber of Secrets. The next week I ordered the first three or four books online. I’ve been caught up in it ever since. That must have been an interesting experience watching the second film first. I wanted to like that one, but it just didn’t do it for me. The third film was even better than the book, in my opinion. The Prisoner of Azkaban is the one that got me to go back and read all the books. Harry Potter is a solid book series, though I probably won’t reread them.